I've always been a simple gal when it comes to jewelry and accessories. For me, the more unique the piece, the more I gravitate towards it. When I was younger, I loved going through my mom's jewelry collection to pick out pieces that I would later "borrow" and wear. And the best part about it? No one else had those same pieces. A little while back, I came across Melody Yip via the nifty world of Instagram and instantly gravitated towards her curate vintage jewelry shop, Mel Scouts. 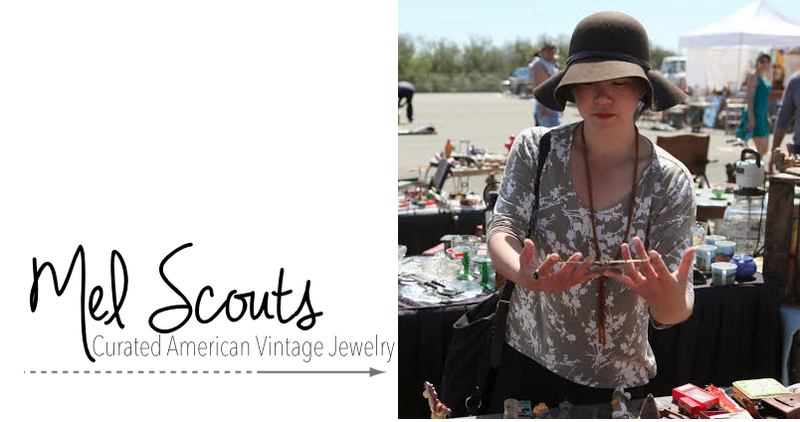 Through Mel Scouts, Melody fulfills her "restless spirit" by constantly learning about and scouting for beautiful vintage jewelry. Today, in another round of pancakePROFILES, I'm sharing a bit more about the Mel and her passion for curating vintage pieces. Tell us a little bit about Mel Scouts - how did it come about? In my junior year of college, I made a bold move and embarked on my first trip overseas by studying abroad in London. It was truly a big step for me to step out of my comfort zone, but through study abroad I learned it was extremely enriching to be independent and try things out. Trips to museums and exposure to old architecture in London and Europe created within me a strong appreciation for older pieces. My love for art and old things has continued to grow over the years. This passion for had led to my opening Mel Scouts on Etsy in April 2012. 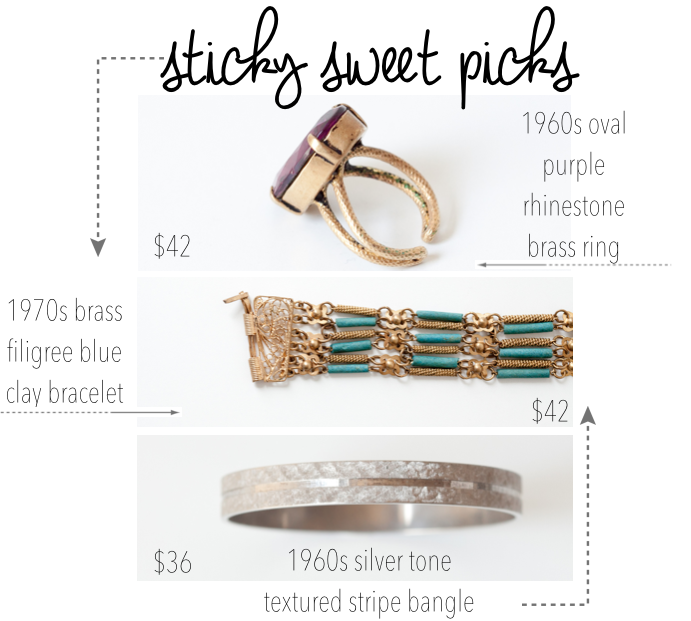 What is it about vintage jewelry that interests you? A few years ago, my husband and I bought a small yellow 1910 Colonial Revival house in Alameda, California. I became exposed and grew to love the architectural details of the house. As we were furnishing the house - many of our pieces were collected at the antiques markets. We mixed new and old pieces. Through this exercise of furnishing our house, I began realizing the same practice could be applied to my own style. 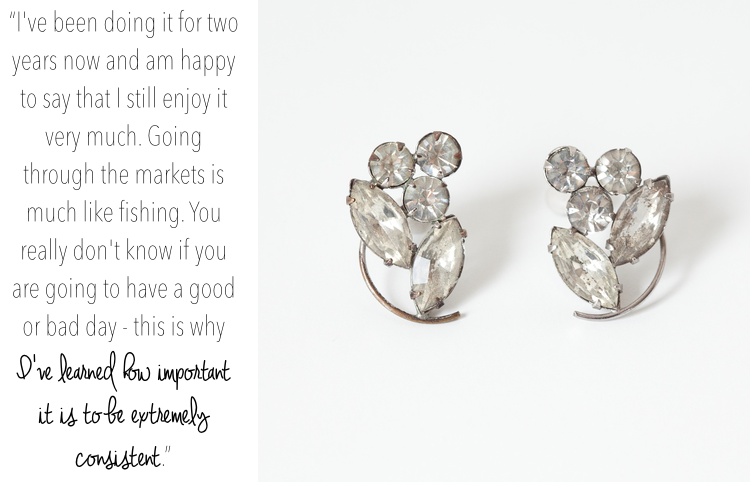 I began buying vintage jewelry and discovering the quality and handiwork in those pieces. My choice in clothing is simple and clean lined. I enjoy being different and by wearing vintage it allows me to have small details that not everyone has. How do you “scout” the pieces for your online shop? Every weekend, I scour antiques markets in the Bay Area looking for pieces for my shop. Every other month, I make a trip to the Los Angeles area and do a bit of scouting and catch up with my dear friend Viv at Etablir. What do you look for in each piece - how do you know when you’ve found a special one to add to your shop? I look for age and beauty in my pieces. I gravitate toward pieces that can either add a bit of drama to an outfit or is simply versatile. Many of my pieces in shop are from the mid century period (i.e. 1950s-70s); however, I love it when I find older pieces. What do you hope others will get out of your vintage pieces? I really would hope that they keep wearing the piece throughout their lifetime. They are owning a bit of history as well as a special piece that has survived trends. You’re primarily based in NorCal - what’s your favorite place to shop or grab a bite to eat up here? Food is my vice. I enjoy eating at the French Mediterranean restaurant "A Cote" in the Rockridge neighborhood of Oakland. It has a nice cozy vibe and delicious rotating menu of food and drinks. I park myself there for at least three hours - enjoying drinks, food and conversation. You can't go wrong with their mussels, pomme frites and a cocktail. This is my happy place to be. I know it may be hard to choose, but is there any one piece that you’ve found while scouting that has been your favorite? If so, why? One particular piece that I picked up on my first dedicated Mel Scouts shopping trip was a 1960s in flight swan pendant. I was taken by the overall beauty of this piece - the simple shape, the creamy backdrop with contrasting tiny black dots at each wing. The clean lines of the bird - personifies the aesthetic direction of the many pieces that I curate. I love finding pieces that embody the feeling of grace and beauty. A large part of my twenties were spent going with the flow and doing what was expected of me by society's standards. The idea of freedom got me thinking about what I wanted to achieve in my life and less about following standards. Over the years, this piece has been more meaningful to me. This bird represents freedom. I feel free to make my own decisions and take action in my own life. I am unable to put that little piece in the shop. Do you have any advice for others who aspire to turn a passion into “work”? Execution is key. Tons of people love to talk about their dreams but actually do nothing about making those dreams come true. Success requires hard work and dedication is required . Make to do lists that are realistic and do not forget to look back celebrate your achievements along the way. Be inspired everyday. Looking for inspiration everyday will keep you going through those dull and low moments. Inspiration can come from many avenues from random and purposeful conversations, blogs, business articles, and the list keeps going. Developing the daily hunger for knowledge and inspiration will keep you open minded about where your work is taking you as well help you see opportunity. And of course, the golden question, what is your favorite type of pancake, and why? I love my pancakes with small dark chocolate chips mixed into the batter with whipped cream and powdered sugar on top served with a black cup of coffee. I don't have much of a sweet tooth - so the dark chocolate, cream and black coffee suits me well. Above are just a few of my favorite pieces that Mel currently has on her new site. Visit her page and get free shipping on all US orders! Special thanks to Mel for taking the time to answer my questions and share her beautiful shop with us. Hope you guys enjoyed the latest post in my pancakePROFILE series - as usual, if there's someone you want to learn more about, don't hesitate to leave your suggestions!